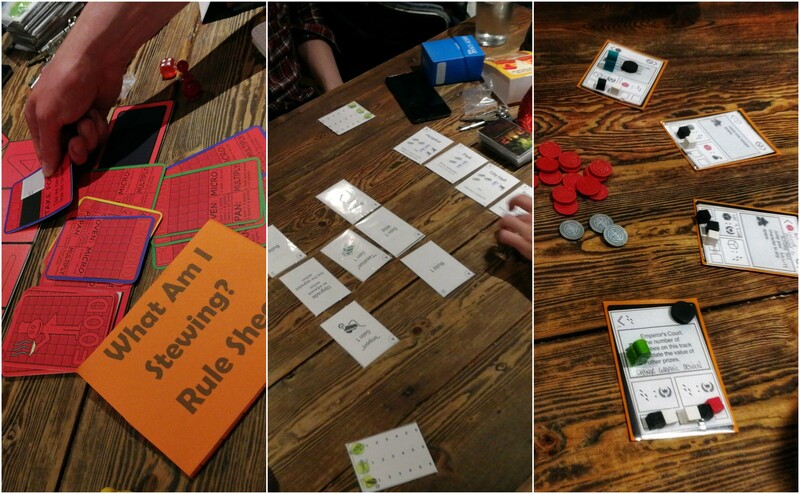 With Ethan, Robin and Jen all sprinting around preparing for UK Games Expo, I’ve taken it upon myself to write thoughts on the games I played at the last playtest session, which happened on 17 May 2018. We assembled at our current preferred venue of Against the Grain on Wexford Street to play some games. If you’ve heard about this contest, you know that you need to design a game with the theme “China”. After being very disappointed with a game that uses a card rondel, I wanted to experiment with the concept. My theme had the players cast as nobles in the Emperor’s court, charged with touring China to report on the activities that would please the Emperor. I tried something new at this session, after 2 or 3 rounds, I jumped in and changed the rules on the fly. Of course, my game was too complicated at the start. I wanted to make the game small, but tough, and tightly paired, so lots of elements relied on each other to score and get their value. Gradually, over the course of 5 quick, rapidly changing sessions, this was stripped down and streamlined. I’ve never gotten so many playtest of one of my games in in a single session. It was great! The game changed drastically over the evening, and definitely became more fun and quickfire. I learned a lot, and I’m now pondering where to take the design. However, with a very busy June in store, I’m not sure I’ll make the deadline. A tricky part of writing these reports is to give a general gist of what the game is about without giving too much away. For some reason I’m finding it very difficult for What Am I Stewing?! It’s a dexterity, speed card game, where you are trying to place your action cards so they resolve before other players. Its frantic, but I think that captures the theme of cooking in a professional kitchen, which it’s based around. In the current iteration everyone was rushing to try and grab the first action slot. This was great, but I thought there was space to play with potentially having different spots give different rewards, to try incentivise players to go second, or maybe even third. It also felt that certain actions were completed more times than others, with some only being availed of when no other action was available. To me, this makes them seem underpowered, and perhaps they could do with a bump. We had a great discussion after the game, and there’s great potential in the system for a fun game. This is a game Robin has been working on for a while, but made it’s first appearance in a few months. The idea is simple, there’s a 3×3 grid in the middle of the table that had two empty spaces. The other spaces are filled with action cards. On your turn you have to slide a card to an empty space to trigger that actions, which can include gathering resources, building or upgrading some of the action cards. This mechanic has become an established part of the meta of our playtest group, with a few different people having a crack at including it in a design. Robin has been the most dogged, and I think he’s getting there. The mechanism presents some challenges in that you can’t really plan your turn as the actions available will change. This also means a really vital action might be locked out to you at vital times, which can be frustrating. Seeing other players get 3+ resources on their turn, and then when it comes round to you only being able to get 1 resource for reasons beyond your control irked me a little. But I think it’s nearly there. So, there you have it! With so many of our frequent playtesters off at UK Games Expo next week, our playtest session will be postponed, but it will return soon. Keep an eye out for the next one!